Colorado has had its share of weird tales, from the ghostly glimmers in the old cemetery at Silver Cliff to any number of “haunted” houses. We told the story of the Hindry House, one of Denver’s most celebrated haunted houses, on Sept. 21. But there are many more. Moviemaker Russell Hunter, who filmed the Changeling, an edge-of-the-seat horror picture, a few years ago, said in an interview in 1980 that the strange events depicted in the movie happened to him while he lived in a mansion that stood on the edge of Cheesman Park. The house that once stood at 1739 East 13th Avenue the house since has been torn down. Slightly more than a week after he moved in, strange things began to happen, he said: Banging and crashing were heard regularly, apparently coming from a bedroom fireplace. One morning, Hunter yelled “Stop it!” and never heard the noise again, he said later. Next, doors began to open and close mysteriously by themselves, he said, while walls vibrated and threw paintings to the floor. A woman he met at a bridge game told Hunter he undoubtedly had a poltergeist in the house. At another social gathering, he said, Hunter met a man whom no one later could identify. The man told Hunter the house had a third floor which could be reached through a secret stair concealed in back of a second-floor closet. With help, Hunter broke open the back closet wall and discovered a narrow stairway, covered with the dust of years. In the attic, Hunter discovered a child’s trunk that obtained the diary of a 9-year-old boy whose family had hidden him in the attic because they were ashamed that he had been born a cripple. The journal mentioned that the boy’s favorite toy was a red rubber ball. Not long afterward, according to Hunter, the red ball began to appear in the house and was seen by more than 30 people. Following the suggestion of friends, the moviemaker called in a widely known medium who conducted a seance in the house. palmed him off as their own in order to collect the inheritance. The second boy graduated from a leading university and became a successful industrialist, said the medium. The spirit of the crippled boy would not rest, according to Hunter. The medium, speaking as the child, said his body had been buried seven feet under the closet sill of a bedroom in a designated house in South Denver. They would know it was he, the medium said, because they would find a gold medal with his name and birthdate on it. What’s more, the medium said the spirit threatened harm to the children of the house where he was buried if the owners of the house would not give permission for the search. After a couple of warning incidents affecting their children, the owners of the house gave permission for the excavation under the bedroom. The gold medal was found. But Hunter still had no peace. Back in his own house, some glass doors blew up as he approached them and shards of glass cut an artery, he said. Bedroom wall shook. Not long afterward, the house was demolished on order and, during the work, walls of a bedroom exploded and crushed a man operating the bulldozer, said Hunter. Hunter moved to a house on Kearney Street, but the poltergeist moved with him, he said, continuing its mischievous pranks. Again, urged by friends, the moviemaker called in a priest from Denver’s Epiphany Episcopal Church to perform the rites of exorcism. The rites apparently worked, the priest said. At least, the priest heard no more from Hunter. 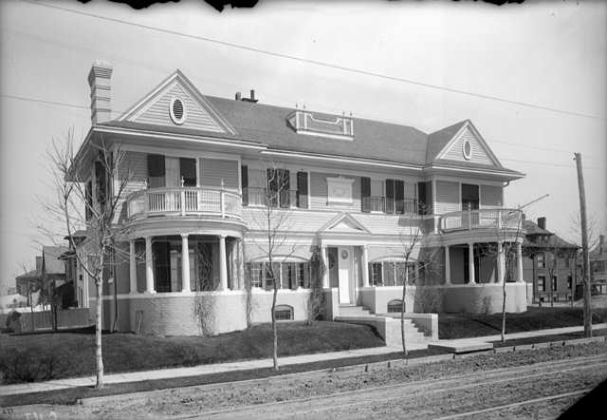 I owned a house in North Denver that was haunted. Built in 1900, the Simi Victorian had other inhabitants besides our family. Not really sinister, though many were frightened by the things that happened there. The family who lived there later experienced the same things.